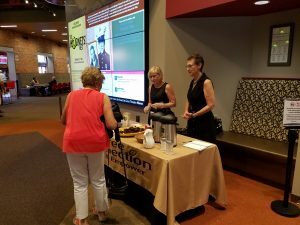 Coffee Connections meeting an audience member during the first week of Hair. We at Geva have always celebrated our community. The way we select our productions, for example – by looking at what is being discussed in our world, in our country, and in our community – ensures that the audience experience is a fuller, richer one. Through “Made in Rochester,” we are bringing some of the best of what Rochester has to offer directly to our audiences, giving both audiences and vendors a richer, fuller experience right here in our building. We’re so happy to help raise awareness of some of the great things happening in our community!